Parents may long for children who are well-behaved at the dinner table, particularly in the presence of guests. However, mealtime manners do not come naturally to most kids, so proper dinner table etiquette must be taught and enforced before children can be expected to mind their mealtime Ps and Qs. Manners eventually become habit, but not before children have had plenty of practice. Don’t wait for guests to arrive or a nice evening out to teach your kids how to behave during a meal. 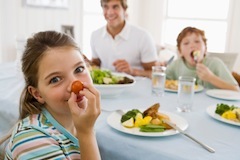 Instead, make dinner etiquette a fun, family pastime at every meal. Be patient while your children learn which behaviors are socially acceptable and which ones are not. Children learn best in positive situations. When your child uses good manners at dinner, show positive reinforcement with verbal praise, recognition or perhaps a hug. Gently correct unacceptable behavior as needed, but place greatest emphasis on reinforcing acceptable behavior at the time it is exhibited at the dinner table or in any other setting.